UK surf towns in world-wide twinning bid? My call for amazing surfing stories yields a curio. It seems moves are afoot to create a novel series of town twinnings. Councillors up and down the land have decided that junkets to the backwaters of France, to secure such useful twinships as Adur (West Sussex) with Riom (Auvergne), Exmouth (praise be) with Dinan (Brittany), and Trowbridge (everyone's favourite Wiltshire town) with the ever-popular Charenton-le-Pont need a shot in the arm, surf-style. Asked to confirm the above, my source said it might not be true, but then again it could be, for, as he put it: "Stranger things have happened. For example, a very famous writer wrote a story about a man who woke up to find that he had mutated into a giant beetle. In another of his books, a man is arrested but never told of his alleged crime. He spends page after page seeking access to The Law, as if this would help, only to be killed 'like a dog! ... as if he meant the shame of it to outlive him' by two men in a piece of wasteland outside Prague. As if that's not weird enough, what of that nice Mr Clegg and his futile attempts to impersonate A Man Of Authority? What of Stonehenge and the late Mr Charles Brackstone who, driving past the ridiculous lumps of granite late one stormy night in the 1970s, wound down his window and gestured at the absurd testaments to man's futility and flicked a 'V' sign and said 'F*** off, druids! ', only a second later to break down and thence to spend a lonesome and terror-stricken night of thunder, lightning, flowing white cloaks and large staffs, yes, all this by the side of the A303, a road opened in 1933, itself the year in which construction of San Francisco's Golden Gate bridge began, trade unions were banned by Adolf Hitler and the first sighting of the Loch Ness Monster was noted in record books that to this date fail to note the usefulness of the Golden Gate bridge to surfers who may wish to travel down to Santa Cruz, a town likely to be twinned with Thurso - have you heard?" 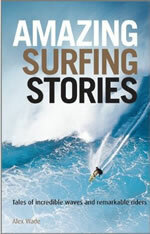 I said I hadn't, and repeated my plea for sensible amazing surfing stories. Anybody out there got an amazing surf story? I ask because I'm putting together a collection of surfing short stories entitled, appropriately enough, Amazing Surfing Stories. It'll be published by John Wiley next November, with distribution here, in the US and Australia. The stories can be about amazing big waves or amazing small waves. Or even amazing average waves (my favourite kind; not for nothing am I known, to some, as Average Alex). Tales can be tragic, funny, poignant, uplifting, inspirational - whatever, so long as there's some kind of amazement. Amazement was mine last night when I returned home to find that my son Harry had blown up the oven. This he and his girlfriend achieved in a manner which they characterised as 'just random'. Not so random was their total failure to clear up any of the broken glass and the general debris of the kitchen. Add to that the fact that my beloved son (he who I wish would start surfing again instead of drifting where I think he's drifting) was decidedly worse for wear, and what do you have? A reprise of the kind of behaviour I inflicted on my parents 30 years ago. Knowing this makes it marginally easier to deal with. But only marginally. If you have an amazing surf story, feel free to drop me a line at alex@alexwade.com. Pictured is Harry in a good place. He's been gone for a while. In fact, his lengthy absence from the blogosphere makes me look like the most diligent and frequent of bloggers. But a search party has uncovered his whereabouts, and Beach Bum has blogged again. The question is: how long until his next post? Here's a declaration of interest: I know Vince Medeiros, the publisher of Huck magazine. I think he's a good bloke, and that's not just because he's been kind enough over the years to commission me to write for Huck. It's also nothing to do with the fact that I help look after the magazine's legal affairs, for which, so far, Vince hasn't accused me of being negligent (touch wood). No, I happen to think Vince is a decent bloke, simply because he is a decent bloke. He's also the writer and co-producer of one of the best surf movies of recent years, Rio Breaks. It was well-reviewed by the esteemed film critic Philip French, and tells the story of how surfing influences the lives of two young lads from the impoverished favelas above Rio de Janeiro. If you haven't seen it, you should. It manages to be both uplifting and poignant at the same time, and is worlds away from the usual vacuous surf movie nonsense (apologies, all lovers of the usual vacuous surf movie nonsense). Vince tells me he's set up a fund-raising campaign to coincide with the release of both the DVD and soundtrack for Rio Breaks in Europe. The idea is to send a meaningful donation over Christmas, which will help ensure the continued survival of the Favela Surf Club, an NGO in Morro do Cantagalo, Rio de Janeiro. Click here if you'd like to help. I studied Ancient Greek as one of my A levels. I was the only person in the class. I wasn't much good at it, but I did pass the exam and, on account of my being the only contender, won the school prize for Greek two years running. If only success in other spheres was so easy. As time has gone by I've found that having Ancient Greek is very useful. It enables me to decode the meaning of unfamiliar words by casting my mind back to what I absorbed as a schoolboy. Latin is good for this too, but I stopped Latin at O level. I am thus rather more etymologically challenged when it comes to words of Latin origin, though upon encountering 'sacerdotal' a few minutes ago, in Edith Wharton's The Age of Innocence, I was able to determine that it meant 'priestly' (the Latin is 'sacerdotalis'). What has this got to do with surfing? Well, another benefit of studying Ancient Greek is that it teaches logical thinking. Classicists may disagree but if memory serves Greek grammar is low on idiom (in contrast to English, for example) and high on structure. If you know X, Y follows, and then you arrive at Z (or, if you will, ὦ). That's Greek. My degree in American and English literature didn't necessarily add to this mode of thought, but the subsequent study and practice of law certainly did. Logical analysis and me? We're the best of mates. How, then, to apply logic to the mess in which British surfing finds itself? In the current issue of The Surfers' Path, Matt Knight eloquently lids the lid on a dismaying state of affairs. Following the demise of the British Surfing Association, Surfing GB was set up. It was funded by Sport England and was intended to be an interim administrative body, pending the creation of a bona fide, all bells and whistles National Governing Body (NGB). This happened about a year ago, but Surfing GB has foundered. Two of its three directors have resigned, there appears to be a big question mark over whether members are insured, mail sent to its Exeter office is apparently unopened and no one answers the phone. Indeed, if it hadn't been for the efforts of Matt and others, the British Surfing Nationals wouldn't have taken place last weekend in Newquay. So, to put things starkly: British surfing, less than two months before the Britain's Olympic year, is in disarray. Surfing is everywhere hi-jacked by advertisers, it's perceived around the world as uber-cool, it funded an artificial reef in Bournemouth, it's enjoyed by hundreds of thousands of Britons each year - and yet we don't have a functioning and respected NGB. This state of affairs led me to agree to put my name to a steering committee whose aim is to try and bring some order and coherence to British surfing. After the British nationals - held in the kind of dredging, outsize Fistral surf that a man with a titanium cage in his neck wouldn't try and surf in a million years - the steering committee met to try and work out a way forward. Prior to the meeting, we heard some inspirational words from former Pipe Master turned surf coach Joey Buran. Joey has agreed to coach a British team for the World Juniors in Panama in April 2012. He stepped away from the politics and spoke rousingly of the talent of British surfers, setting the scene, I hoped, for a constructive meeting. Unfortunately, this wasn't quite how things panned out. Surfing GB's sole extant director is Geoff Swallow, the father of one of British surfing's brightest hopes, Tassy. Geoff agreed to take questions from the audience at the meeting, but - and I have no axe to grind with Geoff - there wasn't a lot of progress. Without going into everything in detail, the best way of summarising things would be to say: the majority present asked Geoff to step down as Surfing GB director and clear a way for a fresh start; Geoff said he felt he'd been asked to do a job, wanted to finish it, and so had no intention of stepping down. The result? An impasse. Whither next, for Surfing GB and, by extension, British surfing? The logicians among you (and the illogicians) will doubtless have some thoughts. Speaking personally, I don't pretend to know all the facts, or have the answers, but I do believe that it is a travesty that British surfing is in this state. We have some great waves and some excellent surfers (hats off to Stu Campbell and Sarah Beardmore for some brilliant surfing in the difficult conditions of the nationals), and they ought to be backed by an NGB with resources and ambition. That NGB should also be looking after the thousands of recreational surfers in the UK, from the longboard crew at Sennen to the groms of Tynemouth and everyone beyond and inbetween. It should be working with SAS on things like the Protect Our Waves campaign, encouraging the sterling work of the likes of Surf Action, creating alliances with the media and big brands and getting the message out that surfing is a wonderful healthy, inspiring and life-giving pursuit. And it should also be setting a goal: that within the next five years, Britain will have a surfer pushing for a place on the WCT; within the next 10, that we will have a world champion. Why not? We can do it. I see groms at Sennen and Gwenver who rip, who - with the right coaching, funding and encouragement - could see their names in bright lights in global terms. Their number include Harry de Roth and Oran Lynch; a little older, Seb Smart is still a real prospect. Among the girls, Tassy Swallow should be supported so that hopefully she is on the women's elite tour before long. This is by no means an exhaustive list. Elsewhere, at other breaks up and down the country,there are kids and teenagers who could really achieve. We need an NGB to bring them on. Seven years ago, I was sitting in the line-up at a break in Barbados. I had a black eye and a broken nose, having flown to Barbados the morning after the boxing match that became the last chapter of Wrecking Machine. Lovely left-handers of about head height were sweeping off the point, I was alone save for a turtle, and I started thinking about British surfing. Earlier that day, Zed Layson had told me that Brits were regulars among Bajan waves, especially Russell Winter and also Sam Lamiroy, who had just won an international event on the island. "Brits rip," said Zed. That comment gave me the idea for Surf Nation: I wanted to write a book that celebrated British surfing. It wouldn't be a definitive history - others would be better placed than me for that - but it'd be a passionate snapshot of something I'd loved since I first rode a wave at Saunton Sands aged 17. I wanted to try and represent all facets of UK surfing, but yes, I also wanted to give the lie to the idea that the only people who rip are from Hawaii, California, Oz etc. Seven years have gone by and a lot has changed. I've written about my health problems but, so far as me and surfing are concerned, I'm more stoked than ever just to be able to paddle out and cruise on my 9"1' K-Bay longboard, when cervical myelopathy made it seem as if I might not walk properly again, let alone ride a wave. I've seen a highly talented surfing son, Harry, decide to go for music rather than waves; he rarely surfs any more (but he does play a mean guitar). This has pained me, but it's Harry's choice, and I respect it. Harry will doubtless keep his hand in and, when he's on form, he'll paddle out here and there and be the kind of local surfer of whom others will say: "Who's that? He's pretty good." And then he'll disappear. But forgetting the personal stuff, I don't want British surfing to disappear. We have a surfing culture to be proud of, something as gutsy as it gets, something really special, something absolutely unique. As such, like every other sport in the country, British surfing deserves a professional NGB. I was pleased to see Mr Lamiroy in Newquay at last weekend's meeting. He spoke with conviction and is as fine an ambassador for UK surfing as anyone. At present, Sam's famed ZZ Top beard is not in evidence. What this means, as a matter of logic, is not clear, but one thing is certain: British surfing needs help - fast.